Actually, is it possible to modify anyone's behavior if that person is not willing to listen to input and advice and eager to make some changes. Little kids may need modeling and practice to achieve acceptable behavior simply because they have not performed certain tasks before or because they have not had positive role models. When children have only witnessed misbehavior and poor manners, they replicate them unaware that other expectations exist. If Mom slouches and Dad swears and Grandpa hits and Grandma throws cups and forks to solve issues, it is no wonder that a child mimics these behavior. People tend to copy what they see, behave according to what they have witnessed and lived through, and push buttons as necessary to get what the need. Many schools are implementing a behavior plan that includes five positive interventions by a teacher before s/he directly reprimands a student. So if Susie does not bring her book, a clear and necessary expectation for learning, I have the idea that I must first praise Mitch for bringing his book, thank Sally for opening to the correct page, sending accolades in the direction of Cary for following our classroom procedure, pointing out how Fred and Jennie have their books open and so are ready to learn, and finally, yes finally, thank Tom for his model student behavior with his preparation and attending to rules. Now that my positives are covered, I can come back to Susie and indicate that her missing book will not lead to productivity and respect. I would like to think that I have overloaded this scene, however, teachers tell me that this is the procedure to draw students into line with appropriate behavior. With the above scene completed, the teacher is now responsible to record every action and interaction with every student. Great, except I am wondering when will there be an opportunity to teach. Sometimes structure is good; sometimes it is over-the-top and does not correct misbehavior or solve problems. While there may be a temporary fix when tomorrow Susie brings her book this is also the day that she has decided not to open it. I am not promoting yelling and screaming and hurdling insults onto students, I just am wondering about wise use of instructional time. 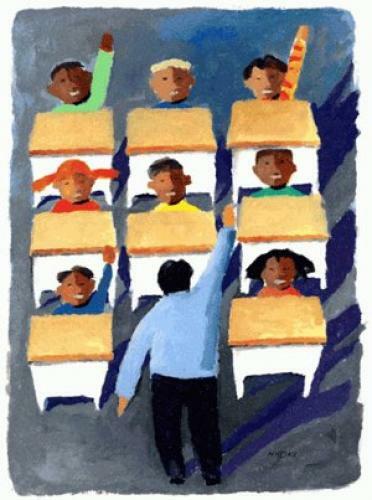 Kindergartners need extra guidance and I understand the five praises may serve a teacher well. In fact, I can see this working through fourth grade and then I believe the wheels may tumble right off of the bus. Junior high students, for example, know the ins and outs and roundabouts of school. They understand rules for bringing materials, sitting correctly in a desk, and using appropriate school language. They have been trained and those who have not mastered the training probably lack the desire to do so. If they were able to slink through third grade, fail subjects in fourth but still move on to fifth, and if profanity and belligerence in sixth led to office referrals but not behavior modification at a personal level, I feel like my five praises will be like dust in the wind. I will have worked to modify behavior in a child who is completely satisfied and sees no need to adhere to rules and procedures. I am also wondering about the parents of these children. As I have already admitted, some parents are not positive role models for their children. They lie, cheat, steal, skip work, grab freebies, and do not respect or understand the value of an education. While I would like to assist every child who lives under these conditions and I will assert a solid effort to try to help them achieve at the highest levels, this means that I am teaching and offering information and insight, not tally marking my five positives so that I can get to the crux of the problem and finally, at long last, exhaustedly address it.